ST. PAUL, Minnesota (CNN) -- John McCain's running mate, Sarah Palin, dealt with two startling disclosures Monday. She announced that her 17-year-old unmarried daughter is pregnant and plans to keep the baby. And Palin has hired a lawyer as Alaska investigates the firing of her public safety commissioner. Bristol Palin, second from right, holds infant brother Trig at Friday's announcement of their mother's candidacy. Palin hired a lawyer three weeks ago to act on her behalf as state legislators investigate whether she may have abused her power in firing the state public safety commisioner for refusing to fire her ex-brother-in-law, a state trooper, CNN confirmed. A report of findings of a legislative inquiry that began several weeks ago is expected to be released just days before Election Day. Palin also revealed that her daughter Bristol is pregnant and will marry the baby's father. John McCain was aware of Bristol Palin's pregnancy before he chose her mother for his running mate, a top adviser to the Republican presidential candidate said. 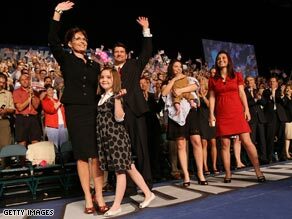 The adviser, Doug Holtz-Eakin, said Monday that Palin "was completely vetted by the campaign" before she was chosen. "Sen. McCain knew this and felt in no way did it disqualify her from being vice president," said an aide who asked not to be named. "Families have difficulties sometimes and lucky for her she has a supportive family." Senior McCain advisers said Palin told McCain about her daughter's pregnancy in one of their "private conversations" last week before he officially asked her to run with her. However, McCain aides said he already knew, having found out about it earlier in the vetting process. "She was very upfront about it," one aide insisted. Asked how the unmarried teenager's pregnancy would be received by the American people, another senior McCain adviser, Steve Schmidt, replied, "I don't know; I'm not a psychic." Delegates to the Republican convention in Minneapolis-St. Paul, Minnesota, said the disclosure of Bristol's pregnancy would not hurt the Republican ticket and may make Palin "a real person like all the rest of us." "I have a 17-year-old daughter, and they start making choices without us," said Annette Ratliff, a delegate from Texas. "I appreciate the choice she is making to have the baby, but it just makes her a real person. It happens every day in America." "I think, if anything, it shows the Republican Party is a real American party," said Rex Teter, another Texas delegate. "Every family has to deal with children, and sometimes children make decisions that parents wish they would not have been made, and things happen. But I think children are a blessing from God." Sen. Barack Obama said firmly that the news should not have any bearing on the campaign for president. Bristol Palin, a senior in high school, is about five months along, according to the aide who asked not to be named. The aide said the Palins and the McCain campaign decided to reveal the information now because of Internet rumors that Sarah Palin's 4-month-old baby, who has Down syndrome, was actually Bristol's. Sarah and her husband, Todd Palin, issued a statement saying they are "proud of Bristol's decision to have her baby and even prouder to become grandparents." "Bristol and the young man she will marry are going to realize very quickly the difficulties of raising a child, which is why they will have the love and support of our entire family," they said in a statement issued by McCain's campaign. They also asked the media to respect their daughter's privacy, a request echoed by McCain adviser Schmidt. "The one thing that all the candidates agree on is this: Leave the kids alone. Leave the kids alone. This is an election about the future of the country," he said. Palin said when running for governor in 2006 that she would support funding for abstinence-only education in schools, according to Eagle Forum Alaska, a conservative group that sent a questionnaire asking gubernatorial candidates their views on a range of issues. Tony Perkins, president of the influential conservative Family Research Council, on Monday issued a statement supporting the Palin family. "Fortunately, Bristol is following her mother and father's example of choosing life in the midst of a difficult situation. We are committed to praying for Bristol and her husband-to-be and the entire Palin family as they walk through a very private matter in the eyes of the public," Perkins said in a written statement.